A decade ago, Peter Heilbron was the go-go managing director of Heineken's Italian subsidiary, mass-producing and distributing beer and related brands. Then he quit the corporate world to live his dream—starting his own boutique wine estate from scratch on a quiet patch in central Italy's Umbria region. 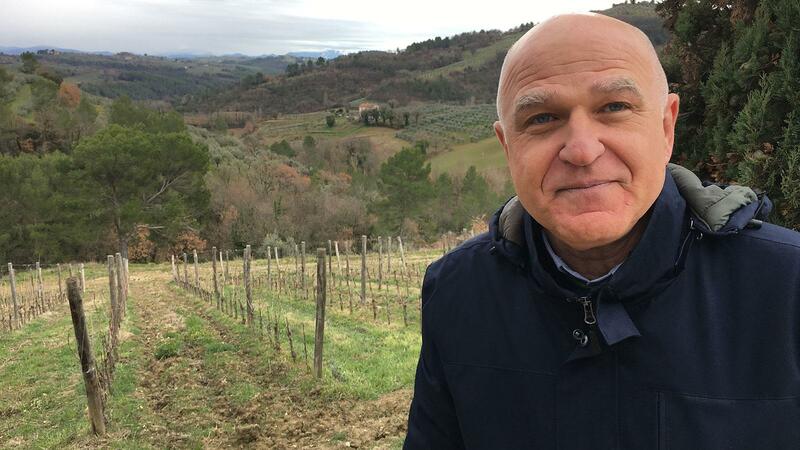 "I quit because there were too many meetings, too many brands, too much delegation and travel," says Heilbron, now 59, standing on an isolated hilltop in the Montefalco appellation and surveying his home, winery and the vineyards around him. "One of the reasons to move here was to do everything myself." Heilbron and his wife, Sabina, chose Umbria for its under-explored potential compared with neighboring Tuscany. That potential includes its signature red, Montefalco Sagrantino, generally known for its power and tannins. In 2007, while still working his full-time corporate job, Heilbron bought this sprawling property in the hills outside Bevagna (pop. 5,000), including about 5 acres of Sagrantino. Using gentle vinification techniques such as whole-berry fermentation, Heilbron made small amounts of Sagrantino in a rented cellar. Two years later—with his new, sleek eco-winery under construction—Heilbron left his job to focus on his Tenuta Bellafonte. Heilbron planted more and more vineyards—Sagrantino followed by white Trebbiano Spoletino—until he reached 27 acres under vine. More than twice that amount of land is covered by olive groves and forest. The son of a German jeweler, Heilbron was born and raised in Milan. He studied agronomy with a specialty in livestock management, before he made a career in food and beverage. A soft-spoken man with a shaved crown and clear blue eyes, Heilbron says he learned winemaking by "tasting, studying and asking questions." Inspiration came from his longtime friend and Montalcino iconoclast Gianfranco Soldera of Case Basse: "The idea was to do something different from Gianfranco, but with the same precision and with an absolute focus on quality," he says. Tenuta Bellafonte now makes a little more than 2,000 cases annually, split between two wines: Montefalco Sagrantino Collenottolo and an Umbrian white called Arnèto. Heilbron occasionally consults with Piedmont winemaker and enologist Giuseppe ("Beppe") Caviola of Cà Viola, and has three full-time employees. But he has studied every detail himself as he has worked to turn Bellafonte into his natural oasis. Heilbron designed his winery, completed in 2010, after Soldera's—building it into the clay and marl hillside with subterranean porous walls made from gabions, steel baskets filled with stones. The winery is energy independent, using solar panels for electricity and generating heat and hot water by burning vine cuttings in a biomass boiler. In the vineyards, Heilbron shuns chemical fertilizers, herbicides and insecticides, using seaweed and plant extracts as a kind of vine homeopathy. He has not pursued organic certification because, in rainy seasons, he sometimes prefers to use a sustainable fungicide to fight mildew rather than copper sulfate, which is permitted for organic use but can build up in the soil and be toxic to bees and other organisms. "I prefer to do it my way," he says. In his cellar, he is equally exacting. At harvest, he leads the grape-sorting team, ferments his wines with wild yeasts (red in steel tanks, white in oak barrels) and ages them in large Slavonian oak casks. His only additive is a small amount of sulfites at bottling. He won't filter his wines because, he says, "There is no neutral filter. Every filter leaves something behind, and I don't want it in the wine." Heilbron is a constant experimenter. In his cellar is one cask of 2017 Sangiovese that he bought from a local grower and fermented partly with whole bunches. He may blend the wine with Sagrantino for his first Montefalco Rosso. "We are on the right track," Heilbron says with an understated shrug. "But you have to try things that are new and different in order to get better."